Spreading northward from the Rio Grande Valley, whitewings are pouring into nearly ever part of Texas. The hunter reminds her yellow lab to stay hat heel. Dawn always energizes the dog. He’d love to plow into the brittle ragweed that borders the cut sorghum, but she wants to seek him cool for the coming work. He’ll he running soon enough. She angles across the field toward a dark corner grown up in mesquite and prickly pear. To her right, a faint band of pink shows on the eastern horizon. Mindful of rattlesnakes, she steps just inside the mesquite thicket, unfolds her canvas stool, and takes a water bottle from her game bag. The dog watches expectantly, then laps from her cupped hand. He finishes his drink and has a good roll in the dust. The hunter checks her watch. It’s half an hour before sunup. The Lab shakes, comes to her side and leans against her thigh, panting more from excitement than heat. She watches morning overtake the field. There are no other hunters. She enjoyed the opening weekend cama­raderie but looked forward to this midweek hunt with her dog. The birds changed their feeding patterns after the early season shooting; she picked this field after three mornings of casual scouting. The shooting wouldn’t be as fast and furious as on opening morning, but it would be fast enough. Biologists believe that the whitewing population peaked in Texas early in the 20th century. By the 1 940s, loss of native brush and trees in the Rio Grande Valley had taken a toll — the population had dropped to fewer than a million birds. In 1947, biologists in South Texas began an annual “coo count” each May to track population trends. But citrus trees are susceptible to occasional South Texas freezes. In 1951, a severe freeze laid waste to Valley citrus groves, and the whitewing population dropped by 90 per­cent. The hunting season was close4 for three years. At that point, biologists realized that preservation of native habitat offered the only hope for a stable whitewing population. In 1957, Texas purchased the first tracts of what would become aptly named Las Palomas Wildlife Management Area and began extensive restoration of native habitat. Through nesting studies, department biologists determined which species of trees the birds preferred, eventually settling on Texas ebony, spiny hackberry, brasil, anacua and a few others with suitable height and foliage density. Further help came in 1971 when white-winged dove stamp funds became available and TPW began purchasing tracts of native brush. Thanks to stamp funds, there now are 23 units totaling about 7,500 acres. In 1978, The U.S. 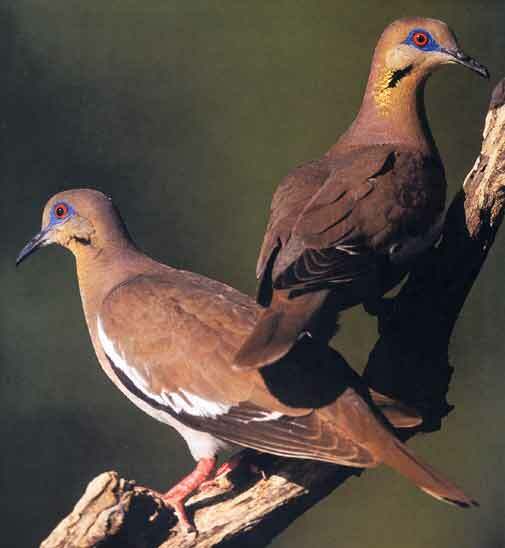 Fish and Wild1ife Service began acquiring tracts of white-winged dove nesting habitat in the Lower Rio Grande Valley. These acquisitions became the Lower Rio Grande Valley National Wildlife Refuge, one of the country’s most important whitewing nesting areas. Then something changed. In the 1980s, whitewings began to appear in significant numbers well north of their traditional Valley nesting grounds. First in San Antonio; then a few years later in Austin; then Waco, Fort Worth and Wichita Falls. Today, the birds nest in every part of Texas except in the northeastern Pineywoods counties. They’ve taken up residence on the coast from Texas through Louisiana all the way to North Carolina. They’ve even spread to Canada. Last winter, Waggerman received reports of two whitewings at a feeder in Newfoundland. What happened? Waggerman believes the doves simply adapted to habitat changes. Oddly, the birds are nesting pri­marily in cities and suburbs despite the availability of good habitat in rural areas. Waggerman attributes their preference to the abundance of feeders in population centers. The northward movement seems to be continuing. That’s exciting news for Central and North Texas hunters and bird­ers who have been unaccustomed to seeing the elegant doves. TPW is working to incorporate these new nesting areas into surveys. According to Waggerman, the birds’ expanding range and growing population are testing the department’s ability to keep up. New reports come in almost daily, and TPW is considering using trained volunteers to help with surveys. The whitewing can be distinguished from the more common and widespread mourning dove by its rounded tail and conspicuous white wing bars, which flash during flight. 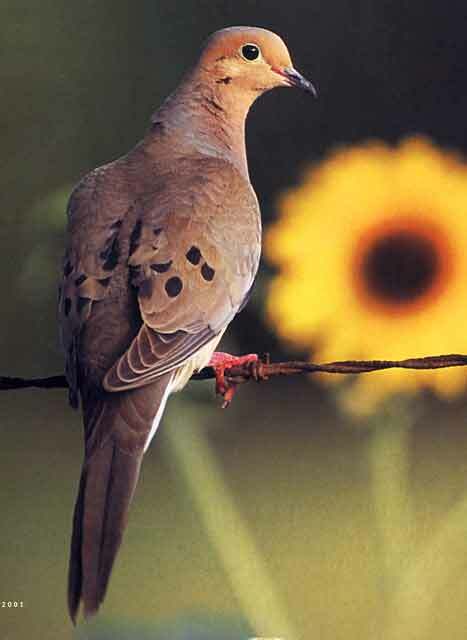 Whitewings arc slightly larger than mourning doves and often fly in large flocks, whereas mourning doves tend to travel singly or in small groups. The white-winged dove's call is a plaintive, cooing who-cooks-for-you. Although the non migratory white-tipped or white-fronted dove has a rounded tail, much like that of the whitewing, it is much plumper than a whitewing, has cinnamon-colored wing linings and is generally found only in far South Texas. Like mourning doves, female whitewings lay a pair of eggs in a flimsy grass and twig nest. Both male and female incu­bate the eggs, which hatch after about 14 days. Nestlings fledge in 10-14 days. Due to heavy predation, only about 34 percent of eggs result in fledglings. Whitewings are colo­nial, meaning that they sometimes nest in large flocks. In recent years, concentrations of more than 100 pairs per acre have been documented in the Lower Valley. A pair of whitewings may produce two or three broods per summer. Public dove hunting areas around Austin, San Antonio and San Marcos should offer excellent hunting for both whitewings and mourning doves. Many outfitters and landowners offer inexpensive day leases. The chamber of commerce in most Central and South Texas towns can point hunters toward productive, affordable dove leases. The Uvalde area continues to be a whitewing hotspot. “In the last few years, the hunting here has been superb for the first week or so of the season,” says Kenneth Arthur, owner of Frio Country Resort. “The white-winged dove has a mys­tique that draws hunters. And the population may be increasing in Uvalde County.” Arthur and his wife, Barbara, offer a variety of hunting options on 10,000 acres of leased property in Uvalde, Zavala and Dimmit counties. Experienced hunters take advantage of the birds’ daily routine. Like mourning doves, whitewings leave their roost just after sunrise and fly to the surrounding fields to feed. Although the birds rely heavily on agricultural fields, native foods such as sunflower, croton, ragweed and pigweed are important as well. After feeding, the doves fly to water sources, then return to their roosting areas to loaf in the shade of trees and brush. Hunting typically slows down con­siderably by midmorning. Then the action picks up again late in the afternoon as the birds return to their feeding ­fields. During dry weather, late after­noon hunting around stock ponds can be excellent. Successful white-winged dove hunters use the same techniques, guns, loads and chokes that work well fur mourning dove hunting — 12-, 16- or 20-gauge shotgun, modified choke and field loads with an ounce of No. 7.5 8 shot. ‘The Lower Rio Grande Valley National Wildlife Refuge now encompasses about 80,000 acres of habitat. Las Palomas WMA includes more than 5,600 acres in 23 tracts. According to USFWS biologist David Blankinship, nearly all the remaining tracts of native brush in the Lower Valley have been preserved by USFWS, TPW, the Nature Conservancy and other conservation organizations. HENRY CHAPPELL’S latest book is At Home on the Range with a Texas Hunter.